The princess listed Herbert Amstrong as first founding member of King Leopold III Foundation for Conservation of Nature. On Aug. 13, 1984, Belgian Princess Esmeralda visited Ambassador College in Pasadena, California, for a special luncheon with a longtime royal family friend, the college’s founder and chancellor. Princess Esmeralda, the youngest daughter of the late King Leopold iii and Princess Lilian, grew up in the castle of Argenteuil near the famed Waterloo. 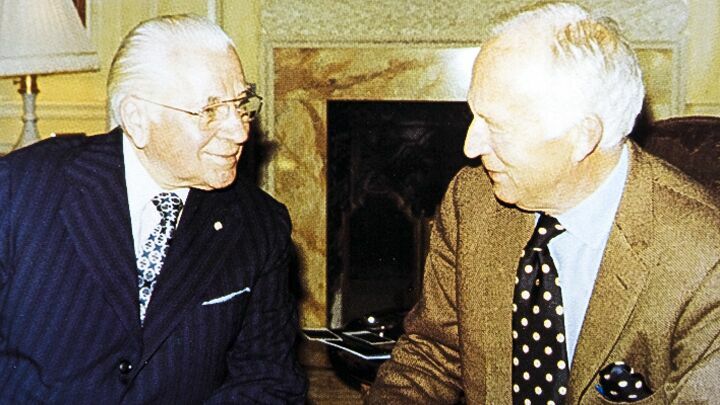 Herbert W. Armstrong had been a guest at the castle for meetings with the king. While studying journalism, the princess lived in Paris, where she gained notoriety working for Le Figaro newspaper. The foundation website relates its history and purpose by recalling that “on June 8, 1972, the founding act of the ‘Leopold iii Fund for Nature Research and Conservation association’ [was] signed. “Article 4 of the statute states: The association aims to study and conserve nature …. The association is a patron of expeditions, studies and publications that relate to its purpose. “The Leopold iii Fund is a strictly non-political association that relies entirely on patronage. All drivers are selflessly serving the ideals of the founder. After the death of King Leopold, hrh Princess Esmeralda of Belgium, in accordance with the will of the founder, was entrusted with the presidency. The president is very committed to attend all meetings. She also watches over all decisions, [ensuring they] are made in the spirit of what her father would have wanted” (translation ours). In 1998, Salvador Moncada of Honduras married the Belgian royal, who later gave birth to two children. Moncada works as a professor, while the princess, in addition to royal duties, continues her journalism work under the name Esmeralda de Rethy, writing various books flavored by the history of fashion and her father’s work. On June 20 this year, the foundation marks its 41st anniversary, as it continues its international activities that have spanned from Asia and Africa to South America. Since his initial meeting with King Leopold iii in 1968, Mr. Armstrong ensured that Ambassador College supported cultural and humanitarian endeavors of the monarch. These were later formalized under the auspices of the Ambassador International Cultural Foundation in cooperation with the king’s foundation. This collaboration was primarily centered in the fields of anthropology and exploration. This partnership was one of the first such humanitarian alliances contributing to the historic declaration of the message of Jesus Christ’s gospel as a witness to the world (Matthew 24:14). Commenting on Princess Esmeralda’s 1984 visit to Ambassador College, the Worldwide News related, “After lunch Mr. Armstrong gave her a tour of [Ambassador Auditorium]. The princess first visited the campus in 1970, when she was 13” (op. cit.). Today, Princess Esmeralda would be pleased that the legacy of this commitment and contribution continues through the Armstrong International Cultural Foundation. “We are an international humanitarian organization dedicated to serving the cultural and educational needs of people everywhere,” writes chairman Gerald Flurry. These objectives are aptly summed up by the Apostle James, whose canonized words exhort, “If ye fulfill the royal law according to the scripture, Thou shalt love thy neighbour as thyself, ye do well” (James 2:8). For more information about the foundation, its activities and how you can lend your support, visit us here.